The skinny? 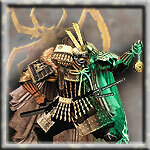 The two clans with the highest total turnout in the Fall Kotei Season are going to be forming and given command of the two Grand Imperial Legions who will be fighting the tide of darkness. No word on what will happen if these turn out to be Spider Clan, but all things considered? I think it will be pretty cool if it were. Long story short, show up for your local Kotei and rep Spider Clan! Make the Story Team have to be creative or corrupt the tools of our enemies from within! The leader from spider would probably have Sora as one of the options, seeing everyone's love for his particular brand of kickass I think he would be awesome! Sora: Demonstrating what Strength is. To everybody on both sides.